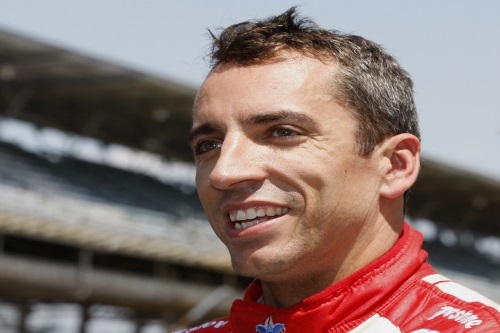 It is with great sadness that the BRDC has to report that Justin Wilson died yesterday in Lehigh Valley Hospital, Allentown, Pennsylvania from the grave head injuries which he sustained the previous day in the closing stages of the IndyCar race at Pocono. In an accident horrifyingly similar to those in recent years to Henry Surtees and Felipe Massa, Justin was hit on the head by flying debris from rookie American driver Sage Karam’s car, which had hit the wall, and never regained consciousness. Justin, who was from Sheffield and had celebrated his 37th birthday at the end of last month, had become a fixture in American professional racing for the last decade but his career began in the traditional way after karting through the junior single seater categories. In 1994 he became the first 16 year old to win a British motor race when he won on his debut in the Formula Vauxhall Junior Winter Series at Pembrey. He was third in both the main FVJ Championship and the Winter Series the following year before moving up to Formula Vauxhall with Paul Stewart Racing to finish second in that championship in 1996 and fourth in 1997. Lack of funding prevented Justin progressing to Formula 3 but he seized the more affordable opportunity of Formula Palmer Audi with both hands, emerging as the first FPA champion with seven victories and winner of Jonathan Palmer’s special prize of a fully-funded season in Formula 3000. By 2001, his third season in this forerunner of GP2, Justin was the dominant champion, scoring more points and taking more podiums than anyone before him. There were tests with Eddie Jordan’s F1 team but it was not until 2003 that Justin had his F1 break with the Paul Stoddart-backed Minardi team. After 11 races in a car which was never capable of running near the front, Justin moved to Jaguar F1 as Mark Webber’s team mate and, in a more competitive car, scored his single world championship point by finishing eighth in the United States Grand Prix at Indianapolis. With no further opportunities in Formula 1 but determined to continue his single seater career despite the views of those who thought his 6’ 4” height would always work against him, Justin moved to the USA, initially in Champ Cars in the days of the split with the Indy Racing League. In 2005 Justin finished third in the championship with RuSPORT, going one better in the following two years when he was runner up to Sebastien Bourdais. After that, Justin’s results were not quite so outstanding but most years produced a win or at least a podium and it was as recently as 2013 that he achieved his best finish in the Indy 500, taking fifth place and setting fastest lap with Dale Coyne Racing. Justin also became a regular front runner in the Daytona 24 Hours, a race which he won in 2012, finished second in 2006 and 2010, and third in 2013. There were other occasional sports car races but it was single seaters which remained Justin’s first love to the very end. In 2001 Justin was elected a Full Member of the BRDC and was awarded a BRDC Gold Star, the ERA Trophy and the Graham Hill Trophy for his brilliant Formula 3000 championship-winning season. To his family, in particular his wife Julia and two daughters, parents and brother Stefan, and to his many friends in racing on both sides of the Atlantic, the BRDC offers its deepest condolences.